Above: Group photo – 46th Annual Conference on African Linguistics. Spot Hugh in the top right, next to a man in a blue shirt; Becky didn’t make the photo as she was setting up for the evening event at the time of the photo. What is your top priority for this coming year? Working from a base in Eugene, Oregon, we aim to support the work of language development and Bible translation around the world. Hugh works with the SIL International’s Language Program Training Department doing continuity business planning for training programs, communications strategies for training, and curriculum delivery to people who are working in Bible translation. Becky’s focus is developing as a linguistics consultant and supporting the ongoing development of the ut-Ma’in language (Nigeria) by continuing her research on the language as part of her Ph.D. program in Linguistics. This is a hugely significant moment in Nigeria’s turbulent history. Never before has a sitting president been defeated in an election. We are also praying for the first peaceful transfer of power on May 29, 2015. What’s something that you have been up to recently? Last week we both presented at the 46th Annual Conference on African Linguistics (ACAL). 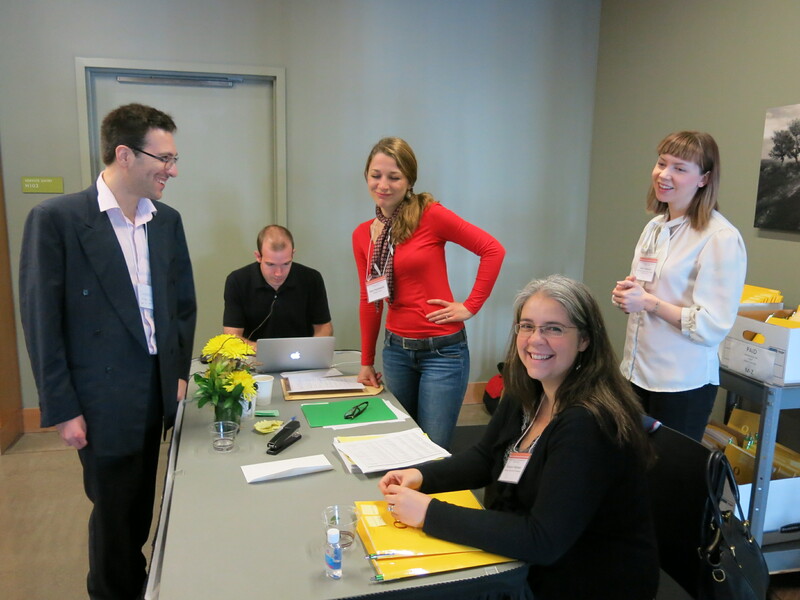 The conference was hosted by the Linguistics Department here at the University of Oregon. Becky was one of the student organizers and helped with planning and registration. Becky helping at the ACAL registration table. Hugh was on tech support for the three day conference. Here is a link to a brief article about the conference from the SIL.org webpage. There were about 150 participants from all over the world. 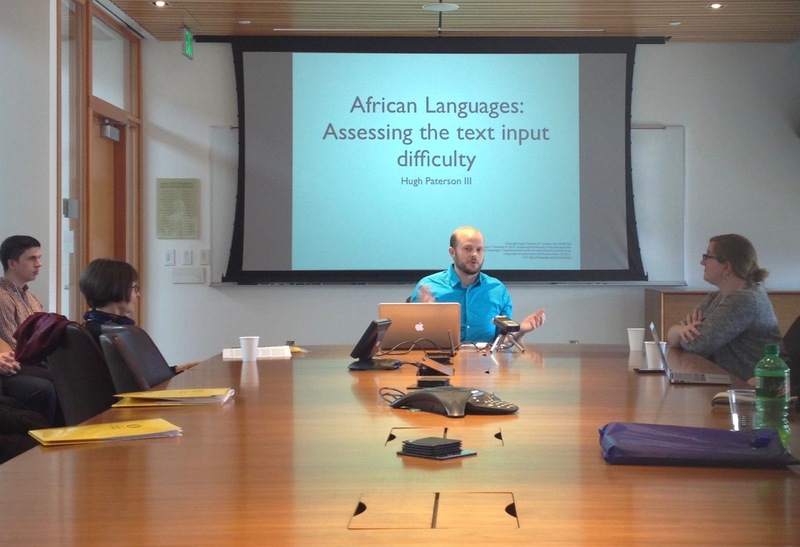 Hugh presented: African languages: Assessing the text input difficulty, based on the research for his MA thesis. Becky presented: The associative phrase in ut-Ma’in, based on research she has been conducting this academic year. Thanks for partnering with us in this work. We have some more news to share in a few days, so be sure to check for Part 2 of this Spring Update. And a happy and blessed Resurrection celebration to you this Easter. 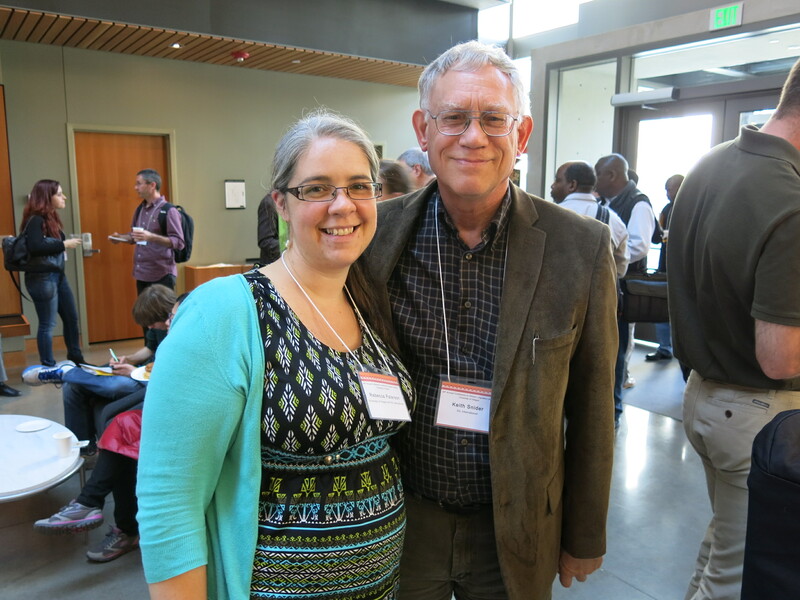 Becky with her former MA adviser from the University of North Dakota, Keith Snider. Keith traveled down to Oregon from British Columbia, Canada. It was nice to reconnect. Thanks to all that made this possible! I will show it to Rodney Christmas Day! Any opinions expressed here are personal and do not necessarily represent the views of any organization we are affiliated with. You can contact us using the form here.